The ultimate utility truck for parks and recreation and highway clean-up. Haul-All offers several options to increase fleet utilization and productivity including Cart and Barrel Dumpers, Chipper Door, various Vacuum Attachments, Utility Cabinets and Pressure Washers. 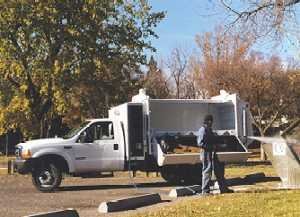 Ideal for collecting waste and compostables, as well as cleaning and maintenance, the Utility Truck provides the needed flexibility for all jobs. With very few moving parts, mechanical controls and low-pressure hydraulics, the Utility Truck is simple to operate and requires very little maintenance. Haul-All Eqpt. Ltd., 4115-18 Ave. North, Lethbridge, AB T1H 5G1. Tel: 403-328-7788; Fax: 403-328-9956.